Dishes & Dirt: RENT an ORGANIC APPLE TREE! 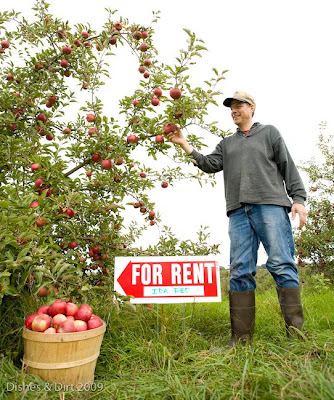 Thats right- Now you can rent you very own Certified Organic Apple Tree at Earth First Farms! Its so easy- and a fantastic deal. "For $50 you get the full harvest from a single tree of your choosing. You choose the variety (Paula Red, Macintosh, Empire, Jonathon, Red Delicious, Gold Delicious, Rome and Ida Red), and whether you want to pay us to pick your apples this fall and deliver them to a drop point in Chicago($60). Then, when we approach harvest, we will coordinate with you to join you with your apples. A typical tree yields 80 - 120 pounds of apples!" This calls for summing up some family and friends having your very own little harvest party- making a day of it. OR plan on picking during EF's Annual Harvest Party- which is usually the first Saturday in October. Times running out (one week! )- Its quite a commitment... But we're in! These apples are the BEST!